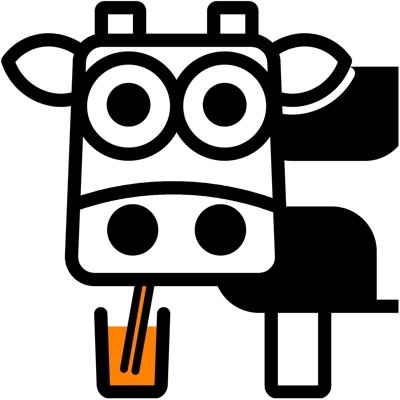 Non-Dairy doesn't always mean soya. 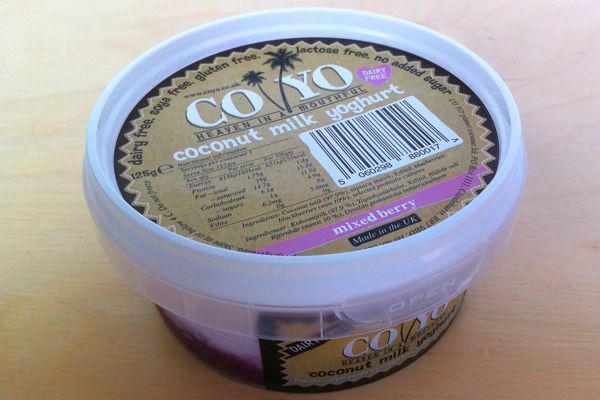 Co Yo cultured coconut milk yoghurt has arrived in the UK. The probiotic yoghurt is available in natural (plain), mixed berry and pineapple. The yoghurt is sugar free and gluten free and proudly carries a vegan label. Originally developed in Australia the yoghurt launched in the UK earlier this year. 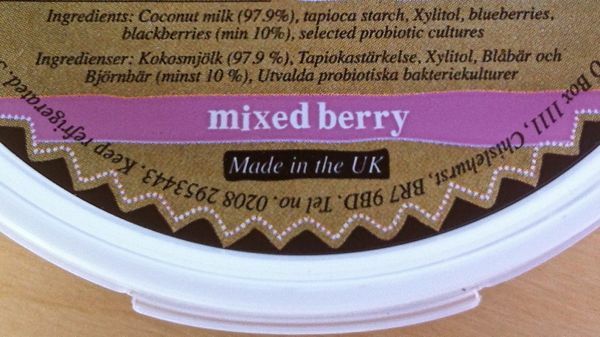 We spotted a pot of the mixed berry flavour in our local wholefood shop and grabbed it for review. The yoghurt is very thick, like a greek style yoghurt, but a little stir reveals its creamy texture. The fruit flavours have a layer of fruit sauce in the bottom of the pot, with the yoghurt on top. If you scoop up some of the fruit sauce you get a sort of rippled yoghurt. 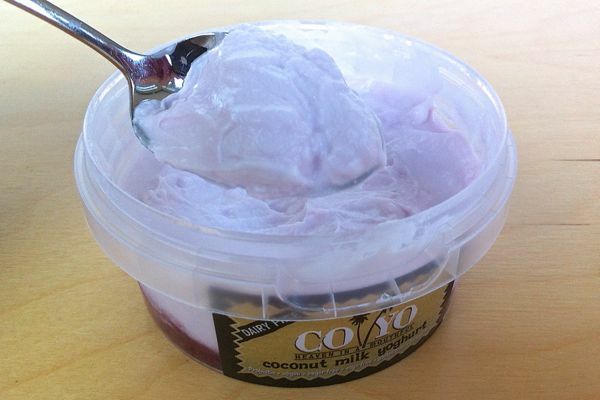 The yoghurt itself has a definite coconut flavour, but it's pleasant and mild enough. Being coconut based rather than soya or grain based there is no graininess. 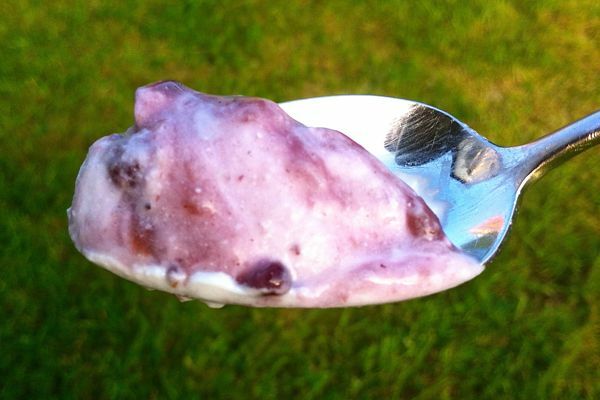 The mixed berry fruit sauce (blackberry and blueberry) has a nice bit of tartness to it. The yoghurt is by no means cheap, as it's made in small quantities, but that should change if it becomes popular. The coconut taste won't be to everyone's liking but as a soy-free option this yoghurt is about the best there is. 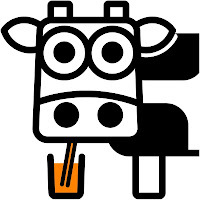 Verdict: The Plant-milk Dairy just got bigger, and better. I wouldn't recommend the new chocolate one. I made the mistake of buying it for my daughter, but it was awful. Very bitter and unpleasant. The fruit ones are probabl nicer if the fruit puree is sweet and masks the coconut taste a bit. I thought it tasted like coconut cream rather than yoghurt. Agree, the chocolate one is vile. I just tried the chocolate one (unfortunately before reading this post) and it's the most weird tasting chocolate yogurt I've ever had!! I gave up on coyo as the quality control seems really poor. I've had so many packs go mouldy way before the date.On one occasion I complained to them and got some freebies and a promise their newer packaging would prevent it happening again, but it did not. Also I have had packs that aren't off per se but the yoghurt smells of vinegar so can only be used in cooking and also inconsistencies in texture and thickness can be like watery fat free yoghurt on one occasion and like thick dried up philadelphia (the only thing I can think to describe it as) the next. I've bought coyo from ocado and whole foods and both have had the same issues. For a cheap soya yoghurt I wouldn't mind if the quality wasn't totally consistent but for what is an expensive product even when on offer I do mind. This is soooo expensive that I've only had it twice, but I absolutely loved it! I must've been lucky and got good batches. I had the chocolate one too and thought it was lovely. I do like coconut though, and I loved coconut yoghurt.